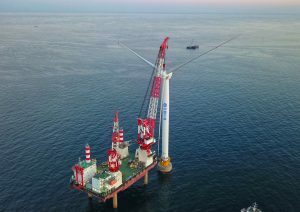 China Communications Construction Company (CCCC) has put into operation the first 6.45MW turbine of the Dalian Zhuanghe offshore wind project. The 6.45MW unit is the country’s first low-temperature turbine and its launch marks the first commercial operation of an offshore wind project in northern China, CCCC said. The 300MW project is located in the Zhuanghe waters offshore Dalian in the Liaoning Province, with CCCC responsible for 200MW. Jiangsu Longyuan Zhenhua Marine Engineering, who secured a contract for the project in July 2018, is in charge of installing the remaining 100MW of capacity. Project offshore installation work began in October 2017 with the installation of the first wind turbine monopile foundation. According to the company, the wind farm will play a significant role in supporting smart energy city construction and alleviating the environmental and energy pressure in northeast China after it is put into operation.